Dürer. 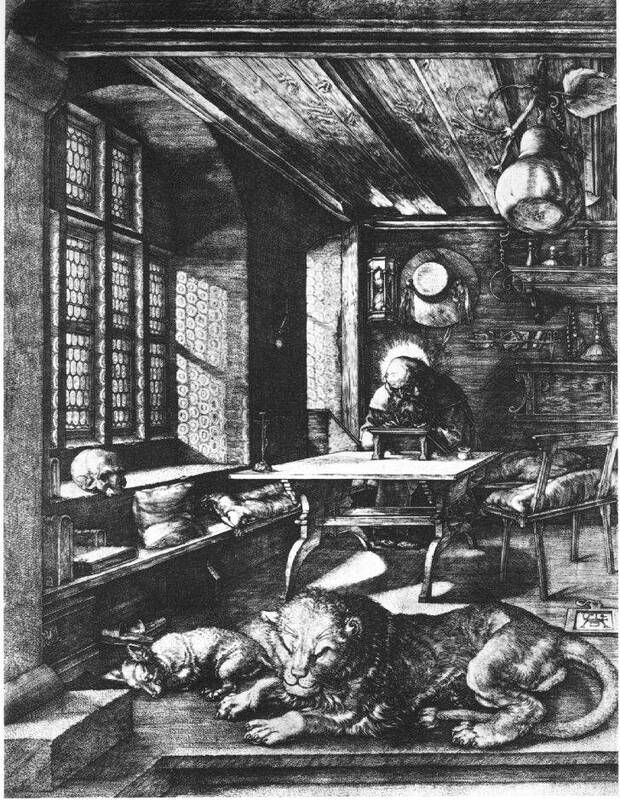 “Saint Jerome in his Study,” 1514. People sometimes say to me, you’re quite particular about… forks, say. Or notebooks, or wrapping paper, or of course, pens. I’d like to think they mean, say, tasteful, or perceptive, but I’ve learned, that’s generally not it. No, there’s some suspicion about appreciation and attentiveness to objects, beyond a point. Why is that? We’re also told that objects aren’t the path to happiness, may often hinder it: as for example in the New York Times piece, “But Will It Make You Happy?” (August 7, 2010) that originally prompted me to write about this. The author notes, in summary, “people are happier when they spend money on experiences instead of material objects.” It cites the notion in psychology of “hedonic adaptation,” meaning that changes in circumstance, such as a new possession, tend to quickly stop affecting you. However, conceding the point that our happiness may relate more to having strong relationships and good experiences — for some — I’d like to see the care for objects as something equally basic and valid, deep in our homo faber (tool-maker) natures. More particularly, I think of it in the tradition of moral/social/aesthetic reactions to industrialization: such as the 19th-century Arts and Crafts movement, and its descendent Modernism and latter-day movements (“Maker,” etc.). response to Mark Carrigan‘s post “Proposal: Quantified Self Research Network” (Aug 1). I’ve participated in Quantified Self matters a fair bit in the San Francisco area in the last two years, including presenting my own #qs-related explorations at a QS event (see “Healthier Information“), attending the 2012 QS conference at Stanford, and meeting the QS founders Kevin Kelly & Gary Wolf. What I’ve discovered is that my interests are more in “quantified self” than in Quantified Self. First, all along I was mainly interested in applying the ideas to “information diet” and cognitive rather than health issues. This is a part of QS — see for example the “Quantified Mind” project from Yoni Donner & Nick Winter — but it seems somewhat marginal to this mainly health- or “well-being”-oriented movement. Whitney Erin Boesel’s observations suggest the changing presence of different factions in QS, with startups, medical doctors and insurance company representatives apparently diminishing. I agree, it shows there is a “quantified self” field that’s significantly broader that Quantified Self, and so a research network like you propose is an excellent and needed idea.